Patrick Quigg scores a second half penalty during the Electric Ireland GAA Football All-Ireland Minor Championship Final at Croke Park in Dublin. 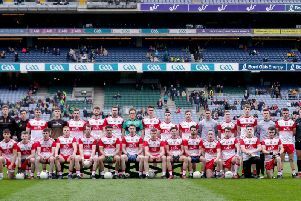 Derry minor manager Damian McErlain said his players can hold their heads high despite what he admitted was a "tough day at the office" as Kerry cruised to a 24-point All Ireland Final victory in Croke Park on Sunday. McErlain's team failed to recover from the body blow of David Clifford's goal after 11 seconds as the Kerry captain went on to terrorise the Oak Leafers with a remarkable display that brought him 4-04. He was unplayable but McErlain said his Ulster champions should be judged on their accomplishments of the past 12 months and not a single game. Derry's Conleth McShane looks on dejected as Kerry lift the Tom Markham Cup in Croke Park after the minor final. "Kerry played very well. They will probably feel they have peaked today and that's what you are looking for in a final," said the Magherafelt man, "They have that experience and in fairness to the quality of the opposition they have been playing all year, they are fit to time their run. "They knew exactly where they were at. We were going at it right from the 18th of May just to get here but, look, we have improved every match and had some mighty challenges, some superb victories and some unbelievable experiences. "Every one of the players should be proud of themselves, their families and their clubs. We can't ask any more of these boys. It was just a damn tough day against a damn tough team in a big spotlight. "It is tough for them but they will learn from it and dust themselves off. The club championship will be in a fortnight's time and they will go again, then the Mac Rory. They will come back at Under 20s or whatever and Derry is in a better place than many previous years. "It is many years since we have even been in an Al Ireland final and we have done rightly this last two or three years to develop players but the next challenge is to take that from players at 18 to players at 22/23." The Derry manager admitted Kerry's early goal was exactly the start the Oak Leafers had been targeting. "Our plan for the game was to take Kerry on, press up on them and see what they could do attacking wise. There was nothing to suggest we couldn't do that leading up to the game but Kerry played very well and going behind early made it all the more difficult. "We felt we could have won the initial throw in but it went the other way and then went really wrong for us with the goal. An early goal would have been a target of yours, we wanted to try and get on top and pull them out a bit, stretch them but, look, they are a serious side. "They are seriously athletic as well as being good footballers and we struggled to contain them all over the pitch. David Clifford is a serious target for them. Granted he has all the individual talent that he has but he has size and physique as well. They had some tremendous other players running off the shoulders of boys also. That was very good and we failed to contain that at times too but the boys tried manfully and kept going right to the end. "We tried to shake it up a bit at half-time in terms of bring Callum Brown on; bringing Declan Cassidy and Conor Quinn on and they all did rightly in the sense that they gave us a freshness but it was a tough task coming in after half-time."